One of the many elements that I love about movies are their ability to link the story being told to the world at large during any given decade. Usually, the films that are produced within a year can be viewed as reflections of what the general public has enduring or themes that are relevant to the times. These days, whether intentional or not, the focus of films have centered around violence, and an excessive amount too. However, if you are privy to the issues getting coverage around the world there’s no need to wonder why. I find the relationship between violence in film and the general social consciousness and behavior to be fascinating. Not in the bland inconducive argument of which one influences the other. Instead I’m more interested in the tactile application of violence in films and what that says about society’s current moods and trends. What is it in the human brain that can muster a reaction of titillating excitement at the show of violence, yet still shock and disgust us at its brutality? Action films have become more intense in its attempts to illicit a physical reaction from audience members, just as news coverage has focused more on the gruesomely terrifying aspects of life. 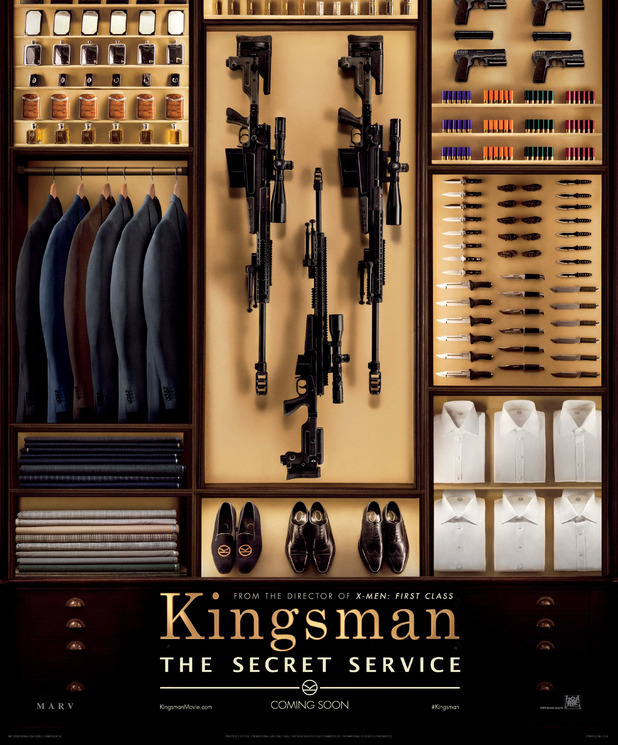 Most action films have come to glorify the discharge of bodily fluids, and Kingsman: The Secret Service has upped the ante in its attempt to be the biggest, baddest action film in recent memory. Though the cinematic elements of bloodlust used within Kingsman is nothing new to film, it’s a reminder to audiences of its unique brutality through seamless direction that harnesses its focus on moments of excess and depravity for the sake of entertainment. Blood splatters on the lens of the camera becoming a common motif in the film. We see the physical effects of what happens when a knife cuts through a body, and we hear the cracking of bones during fight scenes while watching bodies get disfigured in the process. In theory, Kingsman shouldn’t shock audience members. We live in an age where the harsh realities of the world gets shown and described to us in surplus as if it were a commodity. ISIS is beheading helpless victims on camera on a regular basis and a simple google search can lead you to the videos of these victim’s gruesome demise. These are harsh times we are living in, made more depraved by the fact that we can watch a human being die at any moment in real life, sometimes in real time. This dismal reality, along with the country recently seeing the end of a near 10 year war, shows its remnants in cinema. Now, the higher the body count the better the action because if we watch the news, then we can take the fake brutalities. There’s a thin line separating horror and entertainment, yet for some under examined psychological reason (or one I’m just unaware of) we can still gasp in horror when the blood flies and still be entertained. Who would have thought that a slightly whimsical film about spies would be one of the grizzliest films of the year that can exhaust yet excite? Kingsman is Matthew Vaughn’s slight homage to spy films ripe with digs and nods to the James Bond franchise. It’s complete with little winks here, some puns there, and did I mention an ungodly amount of death and gore? Harry Hart (Colin Firth) is a member of a secret intelligence agency who watches a friend, and fellow spy, die before his eyes. That death leads to the search for his replacement, a search that ends 17 years later with a group of young up and comers, most notably Gary “Eggsy” Unwin. Eggsy is the opposite of the upper class, gentlemanly-mannered spies sought to be a part of the ring. He is instead a low class teenager whose mother relies on drugs and abusive men to keep her numb to the pain of poverty and low self-esteem that she endures. This in turn affects Eggsy who is often the bunt of her drunken lover’s quarrels and demeaning attitudes. 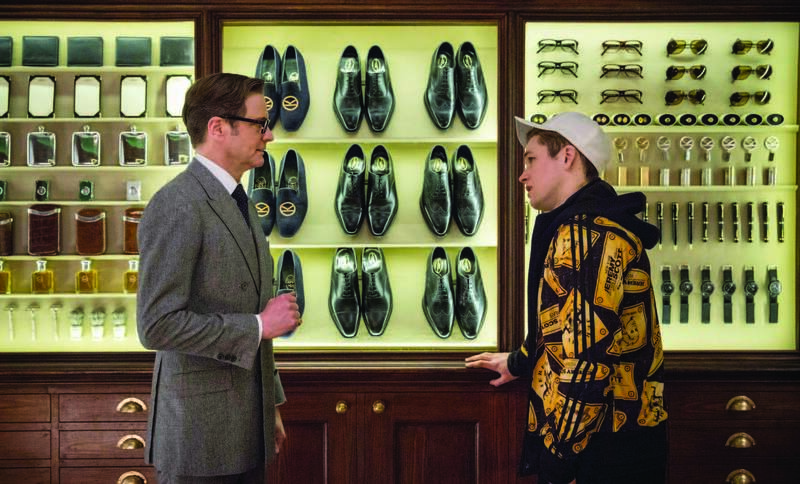 But, Eggsy soon meets his future savior, Harry, who attempts to repay his debt of guilt by guiding Eggsy to become a top notch Kingsman. All the while they are training to rid the world of Valentine (Samuel L. Jackson), a deadly, evil villain with unfathomable power over the general public. Somehow I was able to laugh wildly at elements of Kingsman; slit throats, stabbed eyes, bodies broken after being thrown to the ground. And yet, in the same breath after laughing, I was taken back with shock, gasping at the gratuitous nature of some of the fight scenes. Particularly the infamous church scene in which a massive brawl takes place to first introduce the devious plan of Valentine to the audience. The scene goes on for what feels like hours as we watch in one seemingly smooth take (held together with lots of CGI glue) as Harry goes on a rampage using his skills to massacre everyone in his path. Brains are blown out of heads, bodies beaten to a pulp, and a bones broken as if they were clumps of dirt. 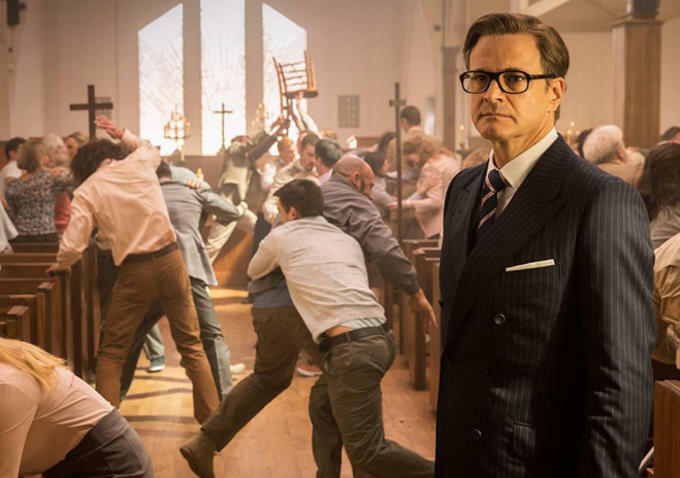 There’s no doubt that Kingsman’s use of violence speaks volumes to the age in which it’s released. In this post slasher movie world body count is glorified, John Wick reminded us of that. In this age where we are seeing real life blood shed due to international media coverage we’re not that queasy at the sight of blood unlike Valentine’s hilarious weakness. We want to see flesh fly, but in cool ways in which the action is chopped up to remind us this in particular is fiction. Perhaps that’s why the church scene is so audaciously exhausting. The edits are seamless making it too real, too raw. Vaughn is aware of the levels he can go as well as the buttons he can push, and he cunningly saves the most brutal aspect of all to show in such. beautifully poetic way that you can’t help but ooh and ahh when a barrage of head explosions shoots blood and guts out in psychedelic colorful assortments. Kingsman definitely has its pitfalls, mostly it’s insistence that it’s not like other films (“This is the part where I’m supposed to reveal my master plan to you to give you enough time to escape. But this ain’t that type of movie,” Valentine boasts), yet everything ends exactly how you’d expect it to. Regardless, Kingsman is the embodiment of a blockbuster entertainment. There’s emotion, action, cool cars, cool clothes and even cooler weapons. The choreography is absolutely astounding in the hands of Vaughn’s masterful direction and the editing techniques of Jon Harris and Ed Hamilton. It’s a fun nod to those before it while setting itself apart with its own trinkets and nuances. But, when you watch Kingsman prepare yourself for a violent ride then be aware of your reactions to it and what that says on a larger scale. SEE IT.Then come back and discuss it with me. I want to chit chat long and hard about this one. If films like Kingsman are a sign of the kind of people we have became, it seems that we have to be more involved than being mere observers and contemplators of what they represent. After all, as contributors (viewers) of the phenomena, we too are part of the problem (extreme violence)–don’t you agree? I definitely agree, especially considering violence has always had a place in society and therefore film. I know we’re used to it but im curious what can we do about it? I like my films bloody and action packed, but I can’t help but still feel a bit uneasy about that considering the real issues taking place in the world. Perhaps that unease that some may feel when watching scenarios of extreme violence indicates we still have the ability to empathize. But what does that mean if that same empathy doesn’t translate to real life? Sorry, i’m sure I’m just rambling nonsense but I’m very intrigued by reactions to violence on screen vs. real life dealings with it. Thanks so much for the comment!